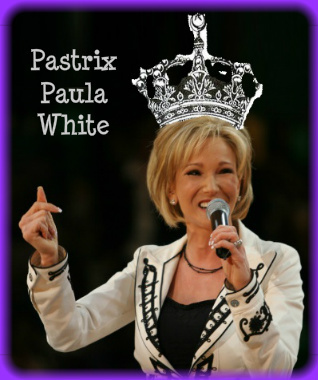 Yesterday Apprising Ministries broke this odd story Pastrix Paula White Set To Be Crowned Queen? But odd is a normal course within evangelicalism today. For example consider that James MacDonald, curator of the Elephant Room, actually resigned from the Gospel Coalition in order to embrace Word Faith mogul T.D. Jakes. See for yourself in There’s More To The Resignation Of James MacDonald From Gospel Coalition. Jakes is White’s spiritual mentor and last Sunday morning his good friend and fellow Word Faith Prosperity Preacher Eddie Long Was Crowned King by quasi-Messianic Jewish-Christian inter-faith modalist “Rabbi” Ralph Messer. You may shake your head and say these kinds of things are still on the fringe of the church, but you’d be wrong. I politely suggest you do need to know that this past May 28th Word Faith Heretic Cindy Trimm Receives Award From Billy Graham Evangelistic Association. Then there’s Word Faith Pastrix Christine Caine Of Hillsong Preaches Sunday Morning Sermon For Steven Furtick and notorious Kenneth Copeland disciple Creflo Dollar has been featured a number of times recently on the Life Today TV program of James Robison. The same program that features wildly popular Southern Baptist Bible teacher Beth Moore. The same Beth Moore To Speak For Hillsong Church, which is the same Hillsong Church that regualrly features the biggest Word Faith heretics like T.D. Jakes, Joyce Meyer and Joel Osteen. Despite Paula White’s attorney denies that an Eddie Long-style ‘coronation’ will take place FC still continued to insist the coronation of White as a Word Faith queen by Messer was going to happen. Daniel Beirute, attorney for Florida-based televangelist Paula White, unconditionally denied that White would be ‘coronated’ as was Bishop Eddie Long in a widely ridiculed ceremony in Lithonia, Ga.’s New Birth Missionary Baptist Church that went viral on YouTube.